Last weekend was 4th of July, and it was probably the first time I had spent the holiday weekend at home in at least 7 or 8 years. Though I really missed the River, it was nice just to chill at home, get some things done, and hang out with friends. It was also the weekend of the Fillmore Street Festival. Because of its proximity to me, we ended up at my place at the end, drinking and dancing, and...checking our iPhones. We took this picture as a joke, but it really wasn't. Typical of iPhone users, we can't get enough of our own. One guy had commandeered my speakers and had his plugged in there. Others were texting incessantly to friends they were meeting later (or perhaps someone across the room). 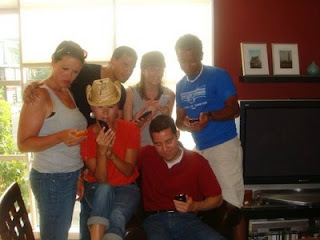 Some of us were showing each other texts from other people to figure things out. But none of us put ours down for more than say 2 minutes at a time. Sad commentary on "kids these days" (even though none of us are kids), or on us "grown ups" (shudder) who didn't grow up with these new fangled things and are trying to make up for lost time?